Carpenter bees are an important native pollinator but two main traits yield a bad reputation held by humans. The males like to hover for hours in the sun and get very curious about humans. Phobias everywhere are triggered when these harmless, stingless males zoom over to say hi. Only females will sting under extreme circumstances. Even touching and mild handling by people is tolerated. Unfortunately, these phobias commonly lead to extermination efforts. Granted they can cause structural damage usually resulting from woodpeckers opening the burrows to feed on larvae. In extremely high numbers the burrows themselves can cause structural damage as well. Most extermination efforts result in bees moving a few inches and re-burrowing into the same wood exacerbating the problem. A better solution would be to seal the entire surface of wood with paint to discourage burrowing. As for providing habitat- walking through the east end of the barn sounds like a F1 racetrack as all the males zoom to greet me. They are shacking up in the nonstructural wood of the hay feeder thus post no danger to the barn itself. Special houses can be built to provide habitat to most other solitary bee species, but nothing similar exists for carpenter bees. When making a nest, the bees drill a tunnel then turn 90 degrees which is impossible to replicate, at least with my tool and skill sets. Still, a dedicated habitat will be attempted. 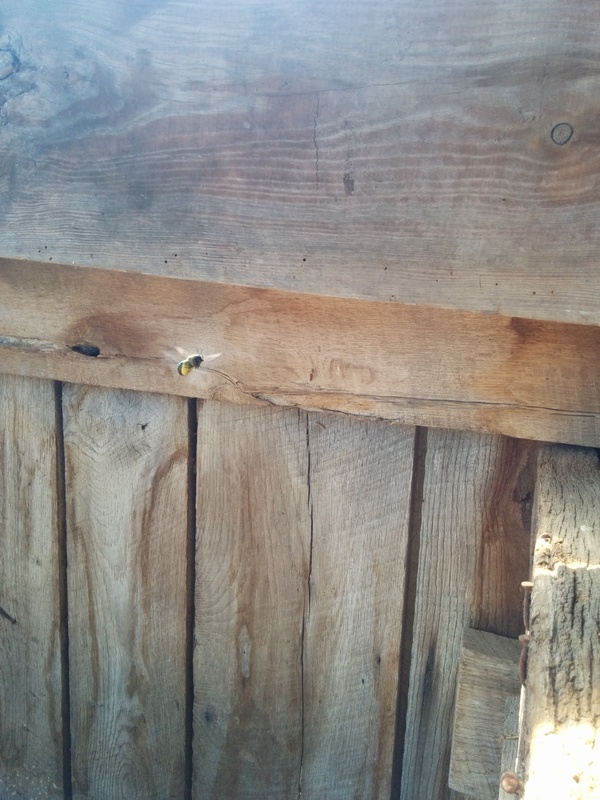 Short ½” holes in scrap untreated wood will hopefully give the bees a place to start their nest allowing them to make the 90 degree turn at their leisure. An update will be provided on the success.